Located in the private gated community of Carillon Beach, Bjoreih is a newly remodeled 2 bedroom / 3 bath home on the Gulf. 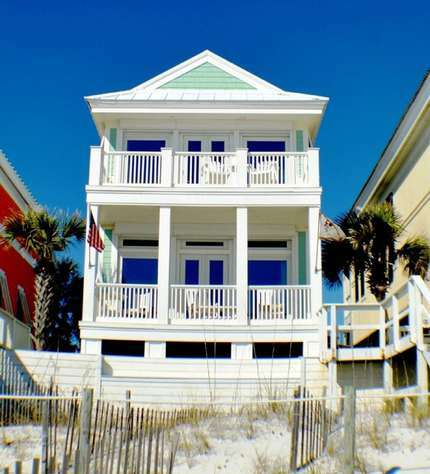 This 3 story home has amazing views of the sparkling Emerald Waters and is only 2 houses away from the beach side pool. The 3rd floor master bedroom has a Gulf front balcony where you can enjoy the sunsets. The guest room on the 3rd floor overlooks Lake Carillon. The kitchen and living area are located on the second floor with a Gulf front balcony off the living room. Bjoreih is a unique name and the owner’s and their children’s initials make up this name. They would love for your family to enjoy their house on the beach. Seasonal Beach Chairs included, 2 chairs and 1 umbrella from March to mid October; weather permitting. If a step back in time, with memories of a simpler life surrounded by loved ones, wide open skies and beautiful Emerald Water would bring rest to your weary soul, then you would want to spend your vacation at Gulfside Getaway. Located in Laguna Beach on the peaceful West end of Panama City Beach, this 3 bedroom, 3 bath Gulf front house with a large, open screened porch, a terraced grilling area, and a living area wrapped in beautiful, warm, old knotty pine is the place to relax and reconnect. In addition to the living area, there are a well equipped kitchen and two bedrooms, each with its own bathroom. A few steps away from the main house is a bunk room with its own bath area, perfect for your teenagers. There is also a laundry room with full size washer-dryer. Rental of this lovely, older Florida ranch beach house gives you a tremendous bang for your buck. 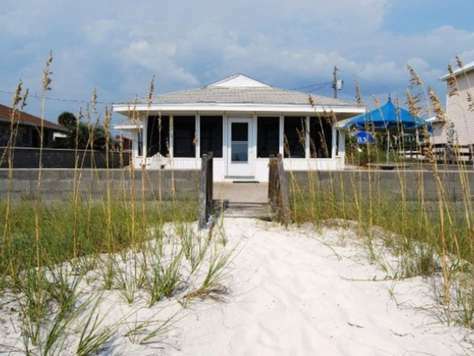 This is a great property to make NEW beach memories.